I was recently asked to review two new releases from Balblair and write an article for The Gathering Place. Those two whiskies were the 2002 vintage and the 1975 vintage 2nd release – lucky me! The article was published on The Gathering Place a couple of weeks ago but if you didn’t catch it at the time, don’t panic – I’ve posted it below. If you want to see the original you can check it out here. Unique (adj. ), being the only one of its kind and unlike anything else. Whether we are the only one of our friends to have run a marathon or the only person at work to have been to Timbuktu, we want to be unique, we want to stand out and we want to be the exception to the established rule. Whisky distilleries are no different. Most distilleries have a core range, usually starting at around ten years old and progressing through to somewhere around (or beyond) twenty-something years old. Nose: Vibrant and fruity with bananas, pear slices in pineapple juice, freshly squeezed orange juice and an apple freshness all vying for my nose’s attention. A little deeper there’s manuka honey, some malty notes and a trace of oak. Palate: A very lively entry onto the tongue. There’s a citrus zest and brief grapefruit zing to begin with which gives way to the malty tones and honey which was apparent on the nose, then cereals and a touch of wood. Finish: The apples and oranges come back and give this quite a sweet, yet well balanced, finish. Nose: Oh. My. Goodness. A very complex, beguiling and intricate nose but it doesn’t lose its direction or purpose for a moment. Polished antique wood, stewed fruits, rich banana and walnut loaf, sultana cake and a hint of cinnamon all come to the fore in turn before fading back to allow something else to shine. Wonderful. Palate: A strong oaky influence, rich rum truffles and chewy toffee give this liquid a whack of gravitas but a citrus sweetness, nectarine flesh, brazil nuts and a dusting of chocolate keep things entertaining. Finish: Lipsmackingly long. Fruity and sweet, with a touch of cinnamon biscuits and a lingering oak presence. A very special whisky indeed. So those are my thoughts on the latest releases from Balblair. 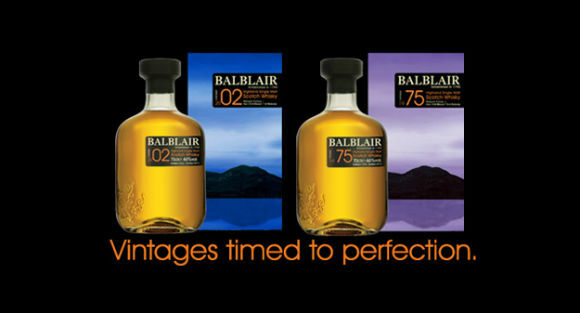 Overall, they are two very different drams however both are still true to the Balblair style; unique but with a strong loyalty to their origins. For me, that’s the beauty of the vintage strategy – if I look at the 2000, 2001 and 2002 for example, each whisky is similar yet slightly different and there are a number of factors to ponder and discuss. We’re given an opportunity to assess the influence a particular type of cask may have on the Balblair spirit, we can track the evolution of the spirit year on year, we can compare and contrast this to the spirit and cask availability from decades ago, and we start to see Stuart Harvey’s personality coming through in the casks he has chosen. This, from a whisky geek’s point of view anyway, is a very exciting prospect. It gives Balblair a very unique identity and encourages me to sample as many bottlings as I can, to better understand where this whisky’s been and where it’s going. I can’t wait to see where they go next. This entry was posted	on Monday, August 27th, 2012 at 11:15 am	and is filed under Reviews. You can follow any responses to this entry through the RSS 2.0 feed. Responses are currently closed, but you can trackback from your own site.